This leadership contest is a battle for the soul of the Labour Party, we hear – repeatedly. Often enough that it has become something of a cliché. But that doesn’t make it any less true. It simply means we tend to stop thinking about the deep and inherent truth of it. Here’s another cliché: it’s about a movement, not a man (a slogan better associated with Bernie Sanders’ campaign although more fitting in Corbyn’s case). Corbyn, after all, is actively committed to the building of a movement, fully aware that without massive popular support, the core policies he advocates would be both too radical to institute and could not possibly endure. But then Corbyn is an instinctive democrat. So he recognises something others on the left habitually forget. That socialism and democracy must travel hand in hand as equal partners (for without democracy, socialism is rapidly debased and sinks to be as oppressive as any system it challenges). Fortunately – and here is the crux – social justice and genuine equality are what the majority would unfailingly choose if clearly presented with such an option, and if only because social justice and greater equality serve the self-interest of the majority. So here’s a third and final thought – perhaps it can become a cliché too (certainly it is not original). That those who today stop at nothing to stop Corbyn are ultimately intent on stopping us all. Denying the vast majority of us basic rights, a modicum of social justice, a functioning NHS, pensions for all, and set solidly against any levelling up of what is now grotesque inequality. Okay, that’s too long to be a cliché – so reduce it; sloganise its kernel of blazingly obvious truth. Corbyn, like Syriza in Greece and Podemos in Spain, is part of the new popular resistance that is rising up from the ruins of neoliberalism and globalization to fight the international banking system and American imperialism. wrote American journalist and political commentator Chris Hedges in an article entitled “where is our Jeremy Corbyn?” published shortly after his leadership victory last Summer. Hedge’s subtext is that Bernie Sanders is no Corbyn – and Hedges is correct, of course. Sanders capitulation to Clinton was the final proof, if proof was needed. However, Syriza and Podemos are no Corbyn either. Sadly, and in different ways, the wheels have now come off both these alternatives. Of the serious contenders then, Corbyn is the last man (currently) standing – and the only one who has a tested record. 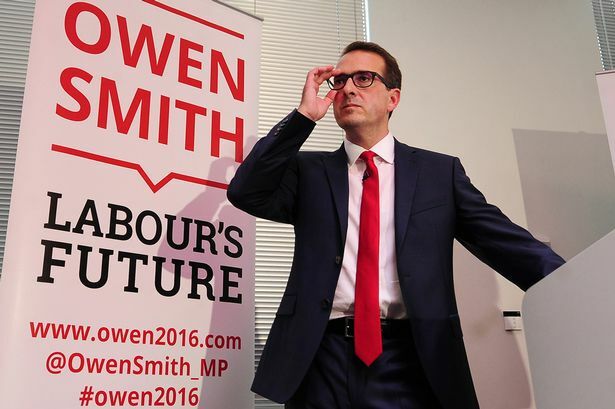 Owen Smith isn’t Superman, but he’s borrowing his poses. The Labour leadership contender almost certainly can’t fly, and can’t boast of X-ray vision. But he’s been snapped adjusting his glasses in the same fashion as the Man Of Steel’s alter ego, Clark Kent. So oozes a puff piece written by Mikey Smith (presumably no relation) and published by the shamelessly sycophantic Mirror at the beginning of Smith’s already faltering campaign for Labour leadership back in mid July. Which is the trouble with politics that obsesses over synthetic charisma and spin. Not only that these are extremely shallow attributes, but that the public has grown weary of them. We see through the sophistry and are turned off by the plastic presentation. Like Austin Powers, Smith’s act is dated and outmoded, but worse still, it lacks any modicum of charm. Owen Smith’s ineffective charm offensive is one side of former Pfizer-mans latest rebranding exercise. The other side is more revealing: that Owen Smith is ‘normal’! We know this because he said so, over and over again, during a Sky News interview. The offhanded inference being, of course, that Corbyn is not as ‘normal’ as he is. But what does Smith even mean with his claims to be ‘normal’ (besides presumably not being “a lunatic”)? In this post-ideological age, Corbyn stands out as exceptional on many counts. Although the quality that singularly distinguishes him from political rivals is simply his sincerity. That he holds principles and values we do not need to test him on. In fact no-one ever seriously challenges his good faith – his voting record alone attests to honest dependability. We know, for instance, that Corbyn opposes the wars. He opposed the war in Afghanistan, the invasion of Iraq, the war in Libya, opposes airstrikes in Syria and Yemen, and served as chair of the Stop the War Coalition (2011—15). He is against Trident too. Likewise, we know that he actively supports refugees including the two million living in Palestinian camps on the West Bank and inside the Gaza Strip and three million other displaced Palestinians living in camps in Syria, Lebanon and Jordan. 7 He is a patron of the Palestine Solidarity Campaign. Equally we know that Corbyn is fiercely anti-austerity. That he is pro-workers’ rights, union rights, women’s right, LGBT rights, and human rights in general. That he is a staunch advocate of a fairer and more caring society with well-funded public sector services, universal welfare (though he says he prefers the less loaded term “social security”) and free healthcare provision for all. And we know that Corbyn is a committed environmentalist. Indeed, it is a delightful revelation to hear any modern politician who speaks so freely and so frankly on all these issues. But then, sincerity comes easily when you have integrity, as does remaining truthful for those who live in accordance with their own stated beliefs. Benn was certainly a signpost. Corbyn is too. So how about Owen Smith and the PLP ‘rebels’ who back him…? Smith says he is as passionate as Corbyn when it comes to all the important matters: housing, education, welfare, NHS. He’s a progressive, and always was anti-austerity and the rest. The main difference, he says, is that Corbyn is ‘unelectable’. That’s right – as any PR man will tell you – if you just repeat something often enough, it becomes true. Smith hopes we will overlook how under Corbyn’s leadership Labour now enjoys the largest membership of any political party in Europe. And that at Corbyn’s rallies thousands regularly turn out to cheer. Smith does well if he manages to corral a few dozen onlookers (even with an ice-cream van parked nearby). No-one is excited by Smith: not even his supporters. But then Smith’s copycat routine lacks the very thing that actually counts: authenticity. He is not the real deal. Corbyn is. And Corbyn’s authenticity is the fundamental reason why the focus of political debate in Britain is steadily swinging back again. Why anti-austerity, pro-public services rhetoric is becoming de rigueur. After less than a year as leader, constantly hobbled by those inside the party (very much including shadow cabinet colleagues like Smith), Corbyn has dragged the debate around regardless, and Owen Smith’s campaign inadvertently serves as further proof that Corbyn is winning. After all, imitation is the sincerest form of flattery. Meanwhile, the PLP’s Blairite inner circle knows that as the desire for real change grows and with it distrust in the established political class, their unstinting efforts to undermine Corbyn are failing, because he is indeed electable. This keeps them awake at night. For as hopeless as Smith is, he was the best challenger they could muster. The rest of the 170+ ‘rebels’ have mostly preferred to keep their heads down for obvious reasons. Smith is more reckless and, even as politicians go, morbidly ambitious: a character flaw that totally clouds his judgment. He believes his own spin. Meanwhile, the only other challenger to step forward was sillier even than Smith. Angela Eagle was evidently advised to step aside again asap. Both have very likely ruined their political careers for good. Ultimately, this fight – possibly to the death given how the embedded Blairite entryists are so willing to sacrifice the party they hijacked two decades ago – pits the prevailing politics of style and spin against the long abandoned politics of content and real change. Hence the relentless mudslinging. Having nothing alternative to say, but with the might of the media behind them, slurs and innuendo is all Corbyn’s opponents can offer. Negative campaigning is all they’ve got. This works up to a point (and sadly always will) but their stocks of ammunition are gradually being exhausted. Which is one reason the attacks have suddenly intensified – this challenge from Smith, though utterly inept (more in a moment), is certainly a blitzkrieg operation. They want to win quickly, not necessarily in this ballot, but in the hope of spoiling Corbyn’s long-term chances, especially as, following the grand slam in the party’s recent NEC vote, his supporters now look set to dig in. So the stage is set for act 2, scene 1. As for how many acts will follow? This we can only guess. So does anyone seriously imagine Smith would survive long once the press have stopped comparing him to Clark Kent and marked him down rather more perceptively as just another “Welsh windbag” (with the majority of Labour party members nodding sorrowfully in accord)? Surely, no matter how rigged – and this vote is enormously rigged, as we know – Smith will be defeated by the end of this bitter and ridiculous leadership challenge. If politics is the art of the possible, as Bismarck once said, then what does this mean? Well, it all depends on where you decide to place the emphasis. Bismarck, who was famed for his realpolitik, would have placed the emphasis on ‘possible’. What is possible becomes, according to this idea, the prime constraint. And Bismarck’s conviction is today’s orthodoxy. Others, however, may prefer to place the emphasis earlier, on the word ‘art’ instead. The constraint then falls not solely on practicability, but on the collective imagining of how a better future can be made possible. A politics grounded no longer in mere expediency – although there is a great deal to be said for pragmatism, of course – but held in check by values and moral principles, whilst elevated by human creativity. On the day Corbyn was elected leader of the Labour Party, he shunned the journalists and ignored the cameras and headed off instead to speak about some of the people who had inspired him. He said “The most authentic thing about us is our capacity to create, to overcome, to endure, to transform, to love.” These words were in fact stolen from Nigerian novelist and poet Ben Okri. Afterwards, Okri repaid the compliment with a poem dedicated to Corbyn, entitled “A New Dream of Politics”. Additional: worst example of BBC bias yet? Emily Maitlis: In the week that JK Rowling went to war with the Corbynistas on Twitter over who should lead the Labour Party. Getting into a scrap with one of the country’s most influential authors probably isn’t a good idea though, as we discovered when Warner Brothers gave us a sneak peak of the next Harry Potter movie. Given that the party is in the midst of a leadership campaign, I raise two points. Firstly, is “Corbynistas” acceptable language for a publicly funded organisation with a commitment to maintain impartiality? Has the BBC ever used the term “Blairite” in an equivalent manner during this leadership campaign or on any earlier occasion? Secondly, although the BBC will defend itself on the grounds that this is a joke, it has already been harshly criticised by former chair of the BBC Trust, Sir Michael Lyons, who said there had been “some quite extraordinary attacks on the elected leader of the Labour party”. 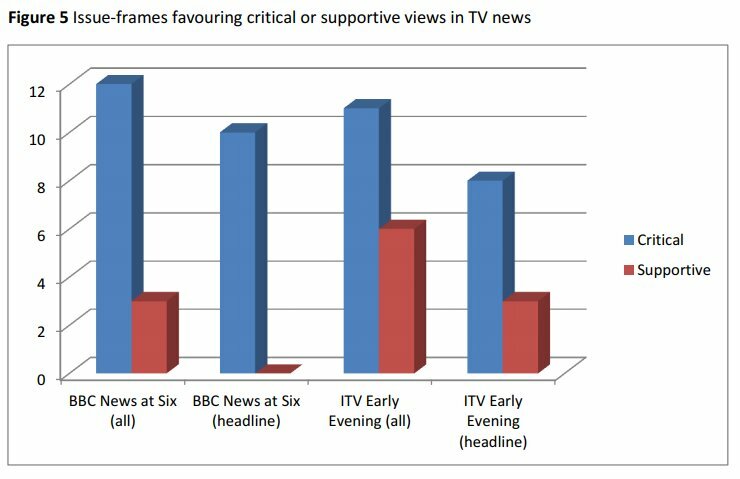 More recently, the BBC was declared guilty of “marked and persistent imbalance” in a report released by the researchers from the Media Reform Coalition and Birkbeck, University of London, which found that “almost twice as much unchallenged airtime was given to people criticising Mr Corbyn than his allies on the BBC”. Given that the BBC is already under suspicion of bias, how does it now see fit to portray Corbyn as, in effect (and regardless of context), the Prince of Darkness? 2 Extract taken from The Road to Wigan Pier, Part 2, Chapter 11, written by George Orwell, published in 1937. UNRWA services are available to all those living in its area of operations who meet this definition, who are registered with the Agency and who need assistance. The descendants of Palestine refugee males, including adopted children, are also eligible for registration. When the Agency began operations in 1950, it was responding to the needs of about 750,000 Palestine refugees. Today, some 5 million Palestine refugees are eligible for UNRWA services. From an interview (August 11, 1867) with Friedrich Meyer von Waldeck of the St. Petersburgische Zeitung: Aus den Erinnerungen eines russischen Publicisten. 2. Ein Stündchen beim Kanzler des norddeutschen Bundes. In: Die Gartenlaube (1876). Reprinted in Fürst Bismarck: neue Tischgespräche und Interviews, Vol. 1, p. 248. Behold the rise of Ukip: an Alan Partridge thought experiment that has broken out of the lab and infected millions. Yes, millions. I’ve just read that Ukip have utterly triumphed in the local elections, and are now in full control of the government, the police, the NHS and the armed forces. Nigel Farage is scheduled to be coronated at Westminster Abbey tomorrow afternoon live on BBC1, complete with Dimbleby commentary and Red Arrow fly-past. By contrast, Farage, like Johnson, appears to be genuinely enjoying himself most of the time, like a delighted Aquaphibian guffawing in a bumper car. And this enjoyment instantly endears him to a huge section of the population on a level that transcends – or at least sidesteps – politics. Many people who hate Nigel Farage the reactionary throwback find themselves liking Nigel Farage the chortling oaf. Being a chortling oaf not only makes you critically bulletproof – oafish chortling being a perpetual escape pod – it functions as a kind of cloaking device, somehow obscuring the notion that you’re a politician at all. On the one hand then, UKIP’s success might be judged as just the latest indication of a growing popular disaffection with the established Con-Dem-Lab triumvirate. A protest vote that was additionally amplified thanks to an exceptionally low turnout, which BBC news reported as being down 10% from the previous local elections in 2009, but equally because a great deal of the polling took place in Conservative heartlands. In other words, here was a protest vote against all the parties although most especially the government. A shot across the bows from the traditional Conservative base. So why did the results in May appear to be such a big surprise? After all, as George Galloway memorably remarked following his own more stunning victory in the previous year’s Bradford West by-election, our mainstream parties represent little more than “three cheeks of the same arse”. The local election results were merely illustrating, therefore, how Galloway’s analysis chimes not only with voters sold-out by New Labour, but across the entire political spectrum – Middle England beginning to feel almost as disaffected and disenfranchised as the Old Labour north has felt for decades. And sharing in this common resentment, neither group is mistaken, for we have all been abandoned to a small crony capitalist elite: the corporations and the less than one-percent who own them. Both working classes and middle classes alike being wrung out and hung up to dry. Of course, the squeeze is tightest at the bottom, and unquestionably so, but this is usual. The poor and the destitute always hit earliest and hardest whenever depression comes to the door; those at the bottom unlucky enough to be our canaries in the pit. And we have three parties prepared to let those at the bottom perish – the Tories doing what comes naturally, and the others sheepishly still towing the neo-liberal line. Our race to the bottom is, however, a trickle up process. The surprise, if any, is how UKIP have convinced enough of the public that they represent any kind of alternative at all, let alone one worth voting for. And it is interesting perhaps that UKIP are more and more frequently compared to the “Tea Party” in America. A comparison that is, in many ways, a good one. The “Tea Party” having been promptly and effectively co-opted by the Koch Brothers, and thereby steered back into line behind the rest of the reactionaries in the Republican Party. Its supporters slowly ditching their more serious and justifiable grievances and fighting on only to protect the constitutional right to bear arms, whilst simultaneously leading the call for extreme measures as advocated by the discredited Austrian School economists and mad proto-fascist patron saint, Ayn Rand. The “Tea Party” suddenly leading the call for “austerity” like a bunch of turkeys demanding to have Christmas every day. At the beginning, however, (and you need to rewind many years) the “Tea Party” were offering a more serious alternative: the emphasis of the movement initially placed not on ultra-extreme free market economics, but on the reestablishment of constitutional rights undone by the Bush administration, of bringing the troops home from the wars, and of fundamentally challenging the Federal Reserve system. To my memory, UKIP has never argued for anything half so significant or genuinely progressive. In fact, it has never remotely challenged the status quo other than in its stated demands for a fast-track out of Europe. Indeed, scratch the surface, and leaving aside for a moment their stance on Europe and European (specifically Eastern European) immigration, there is barely a pimple’s worth of difference between the Tories and their lesser rump UKIP. Just take a peek at UKIP’s hastily cobbled together manifesto (something I imagine few bothered to do, including the millions who eventually voted for them) and judge for yourself. What you’ll find is that UKIP are certainly extreme, but this extreme is mostly a matter of degree rather than programmatic difference. More eager to slash state spending than the Conservatives – aside, that is, from military expenditure which UKIP somehow proposes to increase by 40% in order to buy three new aircraft carriers and to arm four new submarines with US nuclear missiles. And keener on “austerity”, with welfare cuts and more privatisation, especially of the NHS, ensuring an altogether speedier strangulation of the public sector. Finally, and presumably for good measure, UKIP say they intend to be tougher on the sentencing of offenders with boot camps and more prison places. Of course, there is no specific targetting of the white collar criminals still loose inside the City of London (as if there might be!) and no indication whatsoever of any effective measures for resolving the deepening financial crisis. They are, to extend Galloway’s metaphor, the fourth and most grotesque cheek of that same arse. Understandably, there are many who now fear a knee-jerk reaction and a consequent lurch to the right, with both the Tories and New Labour expected to fall into line when it comes to tightening restrictions on immigration more generally and to “reviewing arrangements” for already residing immigrant populations. The justification routinely trotted out, that such actions are needed to keep in check the potential rise of the far right, and so this mainstream shuffle to the right just the necessary compensation. But [Ukip’s] real effect lies in pushing the whole of mainstream political discourse to the right. We saw this with the BNP, where government ministers would make increasingly reactionary statements about immigration the more success the BNP had. And it’s happening now with Ukip – all three main party leaders (Cameron, Miliband, Clegg) have recently made speeches where they promise even tougher restrictions on the rights of migrants than Britain already has. But it’s a vicious circle: far from neutralising public concerns over immigration, this merely antagonises them. [Interviewer:] Do you have fears that the far-right ideology will become even more well-established in Europe? I do, but the point is this ideology does not come from the far right itself. What far right parties do is parasitical on mainstream ideology. They exploit the resentments, and the racism, and the political disillusion that circulates among the rest of society. And they do not need to be in power to have an effect: what far-right parties can do is provoke our liberal elites into taking ever-more authoritarian positions. That’s the situation we find in many countries, from Britain, which detains more refugees than any other country but Australia, to Greece, where the Samaras government is pursuing a crackdown on leftists and on independent media and telling people “you have to trust in us otherwise extremists will come to power”. We should oppose fascists, but we should also fight against the pressure to let technocrats take control of our lives. Ukip employ a similar discourse to the BNP, but their underlying ideas are different. They’re not fascists, but a break-away section of the centre-right Conservative Party who think Britain should leave the EU and are exploiting anti-immigration sentiment to achieve this goal. In any case, UKIP has always and only ever really been a one-trick pony – the rest of their manifesto stuffed together simply to plug up the holes. And so I feel that Charlie Brooker is particularly astute in drawing his comparison directly between Farage and Johnson, since above and beyond their similarly oafish exteriors, the similarities extend, as with the parties they represent, and hugely outweigh any differences – differences being more to do with timescales, if anything, than actual agendas – UKIP ready to lead us into a more authoritarian and socially unjust future, and in half the time of the Tories. All that said, in a twisted kind of way I must confess that a part of me was rather pleased to see the mainstream parties all take a hit in the council elections, and obviously the Conservatives especially so. It reminded me of the election of Rosie Barnes in the famous Greenwich by-election of February 1987, except in a better way. That Greenwich by-election being a signal moment when the short-lived breakaway SDP made their first genuinely impressive gain, and thereby inflicted such a terrible injury to the Labour Party they’d grown out of. A gaping wound and sustained internal bleeding from which it has never properly recovered. Maybe these latest election results will be similarly remembered: as the moment the Tories suffered an equivalent blow. The opening up of a similarly festering wound, and one that has been ripe for a very long time. His intervention is sure to further embolden eurosceptic MPs demanding a tougher line to halt the rise of Nigel Farage’s rampant anti-EU Ukip in the wake of last week’s local elections. Click here to read the full article published by the Huffington Post. So hopefully then, the Conservative Party is about to rupture once and for all. Meanwhile, and if it turns out that UKIP’s minor success also more broadly helps to reinvigorate the old debate over our membership of the European Union, then this too, I very much believe, is greatly to the good. The pity being that it has taken a party as odious as UKIP to raise the profile of what is indeed an important issue, and, most unfortunately, by flying the divisive banner of anti-immigration above their own brand of euroscepticism, UKIP’s position very much detracting from and altogether hampering what needs to be a more serious and rounded debate. In saying this, I appreciate that some readers will recoil almost as a reflex from my own euroscepticism, but then I am happy to jump out of my allotted box as a liberal leftie (or should I say democratic socialist? – both labels having been equally sullied). In any case, I recognise that it is nowadays a fashionably held opinion that those who are “anti-European” (which incidentally I am not) must all be alike, think alike and even look alike. That any objection to the grand designs of the European Union should be left to little Englanders and modern-day Colonel Blimps. But actually such stereotyping is wrong and not only for the usual reasons that stereotyping goes wrong. Such pigeonholing on this occasion happening to rather conveniently shut out much of the opposition that would otherwise come from the disgruntled left. Since when it comes to deeper consideration of the EU and of our membership within it, the debate should more properly focus on the capture of the political system itself. A transfer of power away from independence and democratic governance and into the hands of unelected technocrats. This is actually the nub of the European issue, rising high above and far beyond any smokescreen about immigrant numbers coming from Bulgaria. Indeed, the loss of democratic national sovereignty is obviously affecting residents all across the EU member states, including those only recently liberated from the former Eastern Bloc. So if we are ever to seriously challenge the rot at the heart of the EU there needs to be greater solidarity between its peoples rather than renewed infighting. I think that it is helpful at this juncture to retrace the history of Britain’s entry and EU membership so far. Not only to reveal how perceptions of ‘Europe’ have been significantly altered over the decades, but also to illustrate more clearly, and to back up what I merely claimed above, that many aspects of permissible political alignment come down to little more than slavishly riding on the popular bandwagon of whatever happens to be the trend of the day. Those on both sides of the political spectrum being guilty of this, since, after all, most people are highly susceptible to manipulation of this kind. But losing our way to such political peer pressure is surely one of the biggest reasons we happen to find ourselves in an increasingly terrible mess. When the UK first joined ‘Europe’ in January 1973, the decision had been a purely executive one; the agreement signed behind our backs by the Conservative government of Edward Heath. But then the European Economic Community or EEC (as the organisation was originally known) was merely a burgeoning association of trading nations, and usually known more simply as the “Common Market”. So this was not a change affecting our rights or our constitution, certainly not to begin with, but apparently little more than an expanded free trade zone – and after all, the UK were already founder members of the European Free Trade Association or EFTA, along with Austria, Denmark, Norway, Portugal, Sweden, and Switzerland. The United Kingdom along with Denmark only ceased to be EFTA members when both then joined the EEC in 1973. In these early days of EEC membership, the British public was just as divided on the issue as they are today, and, for the most part, this division in opinion fell along the traditional political fault-line of left against right. Back in the 1970s, however, it was socialists and trades unionists who, concerned by the top-down rule of bureaucrats in Brussels, were the most outspoken opponents. It was then much harder to find opposition within the rank and file of either Conservatives or Liberals (the Liberals being the only party to remain consistently “pro-European”). A few years on, and with the 1975 referendum, the British electorate were at last given the chance to formally express their support or otherwise for the European project. Not to vote on whether or not to join, of course, since by then it was already a done deal, but on whether or not the UK should leave. So a loaded question obviously, and one further biased due to emphasis on the purportedly grave economic risks of an exit. Thus, with the deck fully stacked in favour of EEC membership, the nation went out to vote, and hardly surprisingly chose to stay put. 67% voting in favour, out of a 65% turnout. But then something strange happened. Gradually, and throughout the following decade, the political poles were shifted around. The left becoming increasingly comfortable with the idea of forming greater ties with our European partners, whilst the conservative right have grown ever more concerned and disaffected. The reason for these shifts actually aren’t hard to understand at all. Thatcher loathed Europe, although what she really despised was the worker rights and other guarantees of social justice being snuck in through Europe’s backdoor. As a consequence, her almost rabid hostility towards European federalism (federalism being the big new F-word of the 1980s) being almost sufficient in itself to bring many on the left on board when it came to recognising the virtues of the fledgling union. Surely if this was the only route to achieving social justice then it was better to have more of it. Yet even so, a few on the left held on to their previous mistrust of Brussels. Tony Benn, offers perhaps the best example, having remained unflinching in his objection to Europe’s inherent lack of democratic process. And here it is worth remembering that the “No” campaign of the ’75 referendum had been backed not only by Benn by other significant members on the left wing of the Labour Party, including cabinet ministers Michael Foot, Peter Shore and Barbara Castle. More recently, the EU (which was formally established to replace the EEC after the signing of the Maastricht Treaty in 1992, and again without any national referendum in Britain) has revealed how the organisation’s fundamentally neo-liberal credentials never went away. Barely disguising its own shameful part in the agonies of “austerity” now being foisted on Greece, Spain, Portugal, Ireland and Italy, with these measures insisted upon by “the Troika” of which two of its three parts are the EU itself. These actions serving to highlight what many progressives had failed to understand (and for many years, myself included), which is that the EU was never intended as a socialist project at all, or even an inherently ‘liberal’ one. Rather, and primarily, it has been a vehicle for concentrating power to the advantage of an already powerful financial and corporate elite. Which is why some on the left have remained just as strongly opposed to the EU as many on the right. Membership of the European Community/Union has contributed substantially to the unprecedented decline of industries in Britain, mass long-term unemployment and inability to trade on the world market. Besides huge contributions to the EU budget we have to purchase high priced food, thanks to the Common Agricultural Policy (CAP). Because of the Common Fisheries Policy (CFP) we no longer have control over the fishing grounds around Britain with consequent loss of most of the fishing industry and fish stocks and pollution of the sea. Membership of the EU has entailed a switch away from taxing income and profit to consumption through the imposition of VAT. The burden of these costs and taxation is mainly carried by ordinary people especially those with low incomes or the unemployed. The Treaty on European Union, Euro-federalism and EU Constitution will guarantee further decline as a result of which Britain will become an offshore area of a supranational state. The aim of European Union to be consolidated through the EU Constitution is to have its own military forces and be ruled in secret by unelected governors of an unaccountable European Central Bank, an appointed Commission and committees such as the European Council. These bodies consist of a majority of representatives of member states not answerable to our Government, Parliament or electorate and would be taking decisions which may not be in the interests of Britain. Corporatism and fascism are also menaces which emanate from the drive to a European Union. Racism has been encouraged by the Schengen agreement which is now part of EU law with parallel legislation on immigration and asylum in Britain. In any case, internationalism, as CAEF correctly point out, is quite different to European federalism. Internationalism involves the strengthening ties between sovereign nations, rather than the more aggressive dissolving away of borders between them. And European federalism further undermines the independence of the people of those nations (its member states) by passing executive powers that were held by democratically elected governments into the technocratic hands of an appointed commission.6 The EU – as it exists, rather than how we might like it to be – better understood, not as a grand project for furthering international cooperation, but as one of the vital organs of a fully globalised world. Internationalism means the right to self determination and national democracy for all nations and nation states of the world which includes close relations with our friends in EU states and co-operating with peoples in all countries of the world. And hear, hear to that! I actually wrote the above article just over a year ago, but then decided to hold it back. However, with the forthcoming Euro Elections and in the aftermath of the well hyped Clegg v. Farage tallest dwarf competition, now seemed an opportune time to post it. When Nick Clegg originally challenged Nigel Farage to debate on our membership of the European Union, he was basically on a hiding to nothing. Whereas Farage clearly relished the invitation to steal a little of the media limelight again, as Clegg crossed the stage to his podium, the diminishment of his own political standing was instant. But worse was to follow. In this latest and seemingly most desperate attempt to reverse his party’s fortunes, Clegg’s performance has instead accelerated their transformation back into political minnows. In truth, the downfall of Nick Clegg began long ago with his failings as a politician and party leader becoming quickly apparent once he conceded to the (unduly) prompt signing of the Coalition pact. After all, prior to the election, the Lib-Dems had been gaining considerable ground on both of the major parties, and largely by virtue of winning over disaffected voters who had been traditional Labour supporters (such as myself). However, by immediately committing his party to its role as silent partners in a de facto Tory government, we all felt betrayed. During the lead up to that last General Election, support for the Lib-Dems was also bolstered thanks in part to the lasting legacy of their former leader Charles Kennedy who had maintained a principled stance on the Iraq War. On top of which, the Lib Dems were gaining popularity with many voters because of their perceived honesty when it came to “tackling the financial crisis” – or perhaps more accurately, Vince Cable was then trusted as someone more economically literate than any of our other foremost politicians. Back then, Cable was a rare exception – a politician the public actually warmed to. Prior to taking office, the Lib-Dems had also been synonymous with one electoral issue above all others – their call for significant changes to the democratic process as such, with future elections made fairer under a Proportional Representation (PR) system; a proposed change that was obviously very much in their own self-interest of course. Had Nick Clegg, by more carefully brokering the Coalition deal, succeeded in negotiating and then winning a referendum on PR, rather than losing the chance forever after a quickly forgotten poll on some unheard of compromise called AV (Alternative Vote), his own party might still be sitting closer to the political high table. So here he sold out even those most loyal to his party. The reputation of the Lib-Dems is now damaged almost beyond repair. They have become the scrawny bully’s mate who hangs around and simpers to their overbearing and obnoxious mate. They are not merely unpopular, but deeply distrusted, and most especially by those whose support they captured over the years, switching allegiance out of frustration, and then finally getting a nasty taste of what they inadvertently voted in. So in response to their continuing decline in recent polls, the party’s bigwigs evidently felt that they needed a serious makeover – a new focus of some kind and a distinguishing policy that could mark them out as being different from their big Tory buddies. Advocacy of the European Union was that the singular issue, if only because it was one policy area where political differences between the Coalition partners remained intact. Clutching at straws, the party has therefore decided to concentrate on EU membership and move to promote this as their electoral issue of greatest importance, which given the general level of apathy surrounding British attitudes to the EU was a strange decision under the best of circumstances. And how deeply Clegg and his beleaguered party must be regretting their strategy move right now. In any case, Nigel Farage won the recent debates comfortably, but this had less to do with Farage himself arguing the anti-EU corner effectively, and was mostly down to Clegg’s failure to show up. Rather than pointing to the wonderful benefits of EU membership (and no doubt there are some benefits, although the positives are, in my opinion, far outweighed by the negatives), he instead warned us repeatedly in the debates that “we can’t turn the clock back”, that “an exit would cost jobs”, and moreover, that Britain (or whatever remains of it after the Scottish referendum) might lose much of its political clout. Tired, old rhetoric that plays solely to people’s anxieties. But then, of course, if the EU was half as good for us as Nick Clegg believes, after more than forty years of membership shouldn’t the debate be settled by now. So Clegg’s own position is most untenable because of his determined preference not to allow a long overdue national referendum and thus his refusal to allow any real contest over Britain’s membership of the European Union. If he actually believed he could win in such a genuine debate – one that puts more on the line than his already dismal ratings in the opinion polls – surely he would jump at the opportunity… as would Ed Miliband. 5 Not that Britain is as yet signed up to the Schengen Agreement. And it is worth noting that France and Germany, countries that did join the Schengen Area, unlike the UK, did not then give full access to migrants from the ten countries (Cyprus, Czech Republic, Estonia, Hungary, Latvia, Lithuania, Malta, Poland, Slovakia and Slovenia) after they entered the EU in May 2004. Indeed, only the UK, Ireland and Sweden immediately opened their doors to Eastern European workers. 6 The European Commission, which is the EU’s executive body, is comprised of an appointed cabinet of 28 “commissioners” with administration provided by a further 23,000 civil servants. Hundreds of thousands will demonstrate in Central London this Saturday against the cuts and in defence of the welfare state. It’s set to be one of the biggest demonstrations in recent times. The size of the demo is only restricted by how many people know about it, let’s make sure we go all out in the last 3 days to get as many people as possible there. Coalition of Resistance is producing thousands of placards and a four page broadsheet to give out for free on the demonstration. We need hundreds of people to help on the day – please ask friends, workmates, family if they can help too. We will have two main meet up points at 9am – Embankment Tube and Temple Tube. If your coming from outside London and can help when your transport arrives please also let us know. We also need help everyday this week in our office and making placards. Get in touch if you can help. We have organised a social event for our volunteers and for the international delegates on the eve of the demonstration from 6pm onwards with acclaimed singer-songwriter Sean Taylor playing from his new album “Love Against Death”. The Coalition of Resistance broadsheet leads with Tony Benn and has statements from Len McCluskey (Unite), Frances O’Grady (TUC) and Natalie Bennett (new leader of the Green Party). It puts a clear argument for No Cuts and what people can do next. Coalition of Resistance has invited delegates from across Europe to come to London for the demonstration and is organising a Europe Against Austerity Action Conference the following day. Delegates are coming from Syriza, Front de Gauche, European Left Party, Die Linke, Belgium, Sweeden, Portugal and many more to take part. This event will be live-streamed from our website. We have invited delegates from UK based organisations to attend the conference and it is almost full. If you’d like to attend as a delegate please email coalitionofresistance@mail.com. The TUC is to organise a mass demonstration in London under the banner of “A Future That Works” on Saturday 20th October 2012. The planned march through central London will culminate in a rally in Hyde Park. 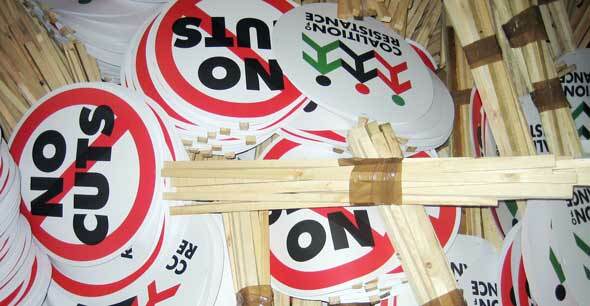 On March 26th 2011 the TUC’s March for the Alternative attracted 500,000 people to a march and rally in London. Click here to read the full TUC statement released last month. Please invite your friends on facebook here. At this meeting there will also be the opportunity to meet up with people from your area and find out how you can help make the demonstration as big as possible. I was recently recommended the excellent four-part BBC documentary series “Labour – The Wilderness Years”, which offers an analysis of the causes underlying the decline of the British Labour Party, beginning with the catastrophic 1979 general election, and following events up until the sudden and tragic loss of party leader John Smith in 1994, and a little beyond. The series, first broadcast in December 1995, is a example of just how good television really can be . Without the need for repeating video loops, and endless recaps on what’s just gone. Without eye-candy graphics, emotive music and an overbearing narrative commentary. Just relevant archive footage, alongside in-depth interviews with those most closely involved in the events. Although suspicious of much that purports to be politically neutral, on this occasion there is also a sense of genuine impartiality. The film-makers allowing arguments from all sides to be voiced, and thus leaving the viewer free to draw their own conclusions. All four episodes have been uploaded (sliced into six 10 minute segments for each) on youtube and so I provide links for the complete lists of the parts that make up each of the episodes. Alongside those links, you can also read my own rather less neutral précis. The fierce war between the left and the right wings of the party begins at the 1980 party conference. Tony Benn, who is already expressing concerns that Britain may be sliding into a police state, sets out to democratise the party. He is roundly condemned by those on the right, but thanks to union retaliation against the hopeless and recently defeated Jim Callaghan, leads the left to a bitter victory at the party conference. To heal the developing schism between left and right, the party then elects the erudite and compassionate Michael Foot over the more bruising but worldly “old flamethrower” Denis Healey. But Foot’s efforts to pour oil on troubled waters is quickly undone as the treacherous “Gang of Four”, led by former Home Secretary and then-President of the European Commission, Roy Jenkins, with Shirley Williams, Bill Rodgers and the ever-so-dashing David Owen in tow, all running off to form their own shambolic party, the quickly defunct SDP. The longer-term consequence being that the Labour vote is split for many years to come. Tony Benn vs. Denis Healey in the race for deputy leader and a fight for the soul of the party, as support for Thatcher’s new Tory government wanes and as riots break out across the country. With Michael Foot still trying to steady the ship, Benn’s battle for democracy and socialism comes to blows against the ‘establishment left’ and their popular heavyweight Denis Healey. Meanwhile, the ambitious Neil Kinnock also begins to push his weight around, and very publicly withdraws his own support from Tony Benn’s campaign by abstaining from the vote. Healey narrowly wins by virtue of Kinnock’s abstention. Michael Foot is then hauled over the coals by the right-wing press for turning up in an inappropriate coat on Remembrance Day. Whilst Foot, in turn, fails to support prospective Labour candidate Peter Tatchell, as he is grilled by the same right-wing media, and ridiculed principally on the grounds that he is candid about his own homosexuality. Finally, and on the basis that they are facing almost certain defeat in the forthcoming general election, the right-wing of the party decide to put together an extreme Bennite-style manifesto purely in order to discredit the policies of the left once and for all. With the nation still rallying around the flag after victory in the Falklands, Michael Foot misjudges the mood again, placing his main emphasis on promoting the manifesto promise of unilateral nuclear disarmament. 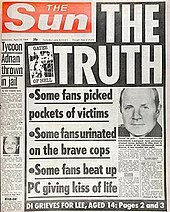 Rupert Murdoch’s press, Kenny Everett and Satan’s little helpers, Saatchi & Saatchi, also work tirelessly to secure Thatcher’s second term in office. Aside from ensuring an election disaster, the manifesto, which becomes popularly known as “the longest suicide note in history”, also effectively sets the seal on the Labour Party’s steady march towards the right. The ambitious Neil Kinnock becomes leader and immediately shows his true colours by choosing to sit on the fence as the Thatcher government crushes the miners’ strike. He then begins “modernising” the party, by, most significantly, expunging the Trotskyist parasite ‘Militant tendency’. During the years of 1985 and 1986, Labour’s National Executive Committee sit through hours of McCarthyite hearings: Kinnock’s inquisition leading to the expulsion of more than 200 members, including, most justifiably, the egotistical popinjay Derek Hatton. But corrupt as ‘Militant tendency’ were, many good and previously loyal party members are also forced out during this protracted witch hunt. In late 1985, Kinnock appoints Peter Mandelson, a former television producer, to work as Director of Communications. At first, Mandelson’s “Red Rose Revolution” means mainly that message plays second fiddle to the party image. New logo, new sets, new emphasis on style over substance… the conception, if not yet the birth, of New Labour. Yet in spite of all the razzamatazz, which includes some surprisingly nifty swing dancing with wife Glenys, “the Welsh windbag” still fails to impress the electorate. Kinnock decides to sell-out absolutely, surrendering many more of his and the party’s remaining leftist principles in deliberate efforts to fall into line with the prevailing Thatcherite neoliberal hegemony. As his ‘revolution’ progresses, Kinnock ruthlessly puts down any dissent coming from within the shadow cabinet, whilst meanwhile instituting a nationwide “Labour Listens” polling campaign, the results of which will provide convenient populist cover for justifying the party’s ideological U-turn. Peter Mandelson, now Labour’s spin doctor, helps Kinnock to promote the ‘policy review’ and to limit the damage caused by those who still oppose the changes. This includes briefing the media against other high-ranking Labour politicians. Michael Meacher, who was one of the victims of Mandelson’s many smear campaigns, is replaced by Tony Blair as Employment Spokesman, and, as they say… the rest is history! Click here to see the remaining episodes on youtube. Following John Smith’s untimely death, the party comes more directly under the centralised control of ‘modernisers’ like Mandelson, Blair and Brown, although the first prominent party member to publicly endorse Tony Blair as the next leader is actually Denis Healey. Whilst Blair’s closest rival, Gordon Brown, conveniently steps aside. With “the Prince of Darkness” Mandelson finally ruling the roost, Labour now drop all remaining pretence to socialism, and also betray their commitments to human rights and the rule of international law. Margaret Thatcher once asked: “If they would abandon their most cherished policies in opposition, what will they do with their promises in government”. A decade of New Labour rule provided us with a very sorry answer. In its wake, we live in a country riven by greater disparities in wealth than ever, and indebted thanks chiefly to market deregulation which Blair and Brown had very much permitted and encouraged. We also have a national health service made ready for privatisation, along with the prisons and our schools. And capping everything, we are mired in an unwinnable war (having already abandoned a second war, fought at the cost of countless lives, and entirely without legal or other justification). So the short answer to Thatcher’s albeit rhetorical question: that in the pursuit of power, Blair, Brown, Mandelson and the rest of the New Labour crew would happily sell their own grandmothers. This is an appropriate juncture to also mention two very intelligent and well produced dramas that tackle similar issues from around the same period. A Very British Coup (Channel 4, 1988) offers a glimpse of how a left-wing Labour government might have tackled the problems facing Britain back in the 1980s. Ray McAnally is wonderful as the down-to-earth leader and MP for Sheffield Central, Harry Perkins, who takes on the ruling establishment, attempts to break the newspaper monopolies, and more generally to bring to heel the military-industrial complex. Hardly surprisingly, Perkins is met with stiff resistance and dirty tricks of every kind. The three-part television series, first screened on Channel 4, won Bafta and Emmy awards. It was based on a 1982 novel by British politician Chris Mullin, who also gives interviews throughout in “Labour – the wilderness years”. The novel was adapted for television, with a screenplay by Alan Plater, and directed by Mick Jackson. Click here to watch on 4OD. GBH (Channel 4, 1991) is a gritty seven-part drama written by Alan Bleasdale, starring Robert Lindsay as Michael Murray, the Militant tendency Labour leader of an unspecified British northern city. 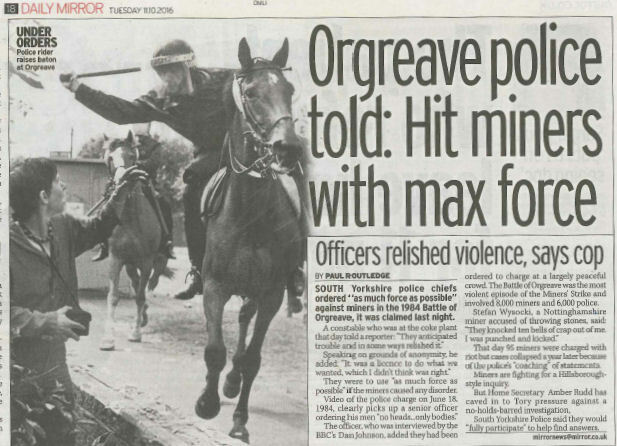 The parallels with Derek Hatton are obvious enough. Michael Palin co-stars as the principled school teacher, Jim Nelson, who inadvertently finds himself fighting against corruption and intimidation. As the plots steadily build, we discover that all is not quite as it first appears. The series was produced by David W. Jones. To better understand how the current situation in Greece has arisen, a new documentary called Debtocracy made by Greek journalists Katerina Kitidi and Aris Chatzistefanou is available to watch online for free, with the option of English, Spanish, Portuguese and French subtitles. The supporters of the initiative included Noam Chomsky, Tariq Ali and Tony Benn. Government of country receives a loan without the knowledge and approval of its people. The loan is spent on activities not beneficial to the people. The lenders know of this situation but pretend not too. If the analysis of the audit committee proves all or part of the debt to be odious the people should not have to pay for it and therefore it should be erased.